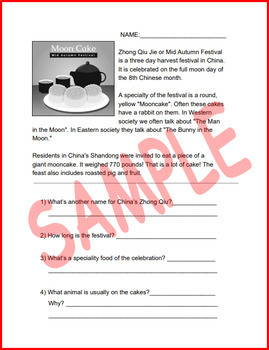 In this NO PREP reading comprehension and question printable worksheets, students will explore a brief history about Thanksgiving in the six different countries. The countries are: The United States, Mexico, China, Japan, Israel and Liberia. Students will refer back to the text to be able to answer the open ended questions. 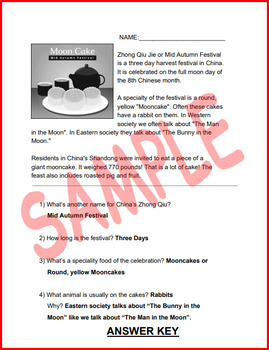 You will receive zip file containing a PDF black & white version of the worksheet and an answer key for each country. The Common Core standards most worked on in this close reading worksheet are RI and RL - Ask and answer such questions as who, what, where, when, why, and how to demonstrate understanding of key details in a text. I hope your students enjoy these seasonal close reading worksheets! These worksheets compliment my Thanksgiving Around the World 19 card Boom Deck.